EEA – THE BLOG | What Happens When Investors and ISO Standards Demand a Strategic Plan for Human Capital Management? Despite all the talk about employee and customer engagement, this field remains in its infancy. Very few companies have enterprise-wide engagement strategies, and those that do wouldn’t even agree upon the nomenclature used to describe their efforts. But now, forces more powerful than we anticipated may be further propelling the emergence of this field. Many society-changing innovations over the last 20 years have had a major impact on business, including the Internet, social media and smart phones, but few of these breakthroughs rose to the level that investors demanded granular action. That is in effect what is happening in the field of human capital management. A recent article on the ESM portal, $2.6 Trillion Investor Coalition Sees Link Between Human Capital Management and Shareholder Return, reports that a coalition of 25 large pension funds with combined assets of about $2.6 trillion are quietly asking leading public companies for specific information on all areas of human capital management (HCM), including incentives, employee engagement, safety and many other issues affecting employees, quality and productivity. As you’ll see if you read the article, the requests are quite detailed and will over time compel organizations to make sure they’re addressing these specific issues, since investors want to see how much is being spent on human capital, on which practices, and how results are being measured. At the same time, as also reported recently in another ESM article, ISO to Add Human Resources to International Standards, the International Organization of Standardization in Germany, which administers the ISO 9000 quality standards, among others, has created a technical advisory group to draft standards for human resources practices and measurement. This will further compel organizations to formalize and report on their investments in people to maximize stakeholder benefits. These trends present an enormous opportunity for specialists in all areas of engagement. How often do investors rally together to insist on public companies implementing and reporting on a specific business process? Read what the HCM coalition is looking for in terms of information from public companies, and it’s clear who can benefit: an army of specialists in coaching, assessment, analytics, communications, rewards & recognition, collaboration, innovation, recruitment and other areas who can potentially help organizations drive customer and employee engagement, productivity and service. If only it were that simple. Significant barriers remain to the emergence of this field. 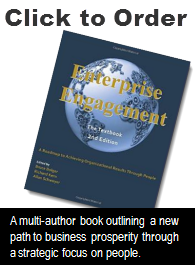 Most organizations aren’t aware of the Enterprise Engagement Alliance or any formal framework and implementation process for profiting from engagement, and all of the above mentioned tactics remain heavily siloed at many organizations. There are no commonly accepted practices for integrating these engagement processes in the manner so well demonstrated in the recent ESM case study: Diversity and Inclusion Power Engagement at Fifth Third Bank. It took the marketing field nearly 20 years to break down silos so that today most major brands now do a much better job of integrating their multiple marketing and sales initiatives. In this newly emerging field of engagement, many of the critical tactics remain stuck in silos because of the lack of effective leadership or understanding of how these tools can be better integrated, leveraged and measured. That’s the great challenge ahead: to educate leaders in the C-Suite, not only of the benefits of engagement – that will be increasingly forced upon our leaders – but of how their organizations can actually profit from engagement in a practical, measurable way.